I really enjoy the nights when my husband says he’ll cook. 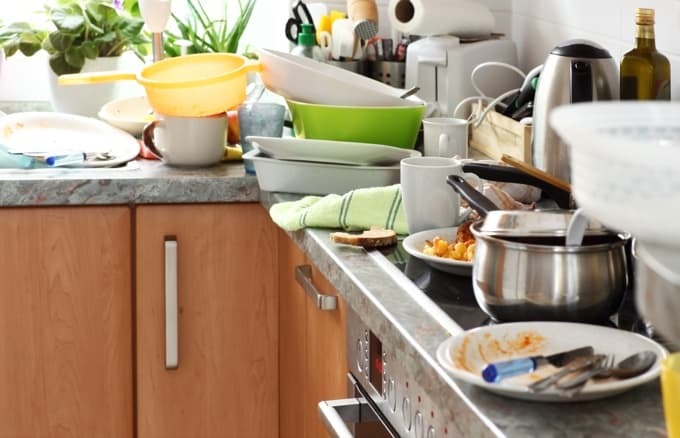 All I need to do is decide what to make, get out all the ingredients and dishes, tell him how to do it and then clean up the mess. And if I’m around, it’s like a game of 20 questions. Seriously, this is NOT my idea of a night off! Plus sometimes just deciding what to make is often the hardest part! So I decided that simple freezer meals could really work to my advantage here. Now all he has to do is dump the thawed freezer bag into a skillet and serve it up any way he wants. One pan and done. 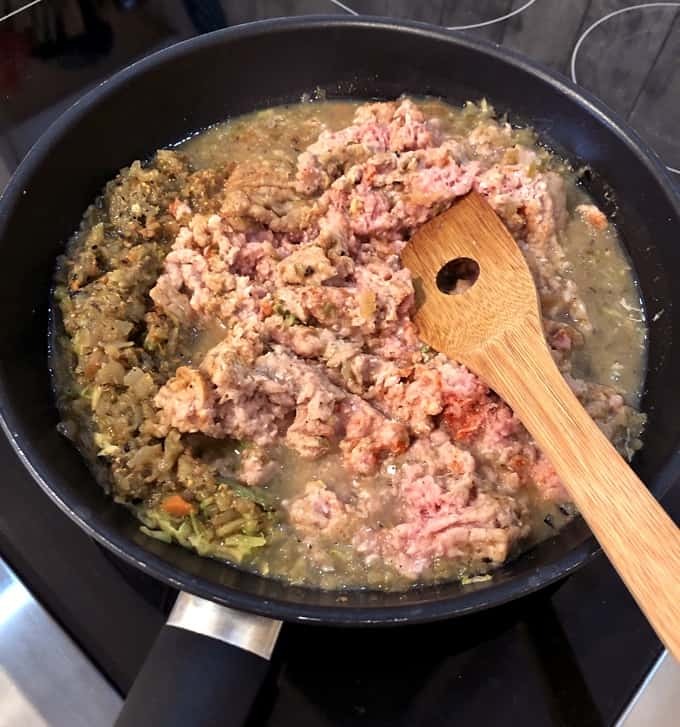 It doesn’t get much easier than that – like with this Green Chile Verde Ground Turkey Meal, which begins with just 3 simple ingredients! With freezer meals like this, it really is a night off. Trust me. Try it. How Many Calories and WW Points in this Green Chili Turkey Skillet? According to my calculations, each serving has 247 calories, *7 Weight Watchers PointsPlus, *5 WW Freestyle SmartPoints. Enjoy! Gather all the ingredients (ground turkey, salt, pepper, salsa verde and zucchini). Wash the zucchini and shred enough for 1 cup. Using paper towels, squeeze any excess water from the shredded zucchini. First add ground turkey meat to the labeled freezer bag. Add remaining ingredients in the order listed above (salt, pepper, salsa verde and shredded zucchini). Remove as much air as possible and seal the bag. Removing air from the bag will help prevent ice crystals from forming, reducing the chance for freezer burn. Lay the bag flat in your freezer (at least until hardened). You’ll want to plan ahead and make sure your freezer bag is completely thawed before cooking. Remove the bag from the freezer and let it thaw in the refrigerator for 24 hours prior to cooking. Cook on medium/high heat for 15-20 minutes until meat is done. Remove from heat and serve. When you’re ready to cook: Add contents of the thawed bag to your slow cooker. Cover and cook on LOW for 3 to 4 hours, or until done. 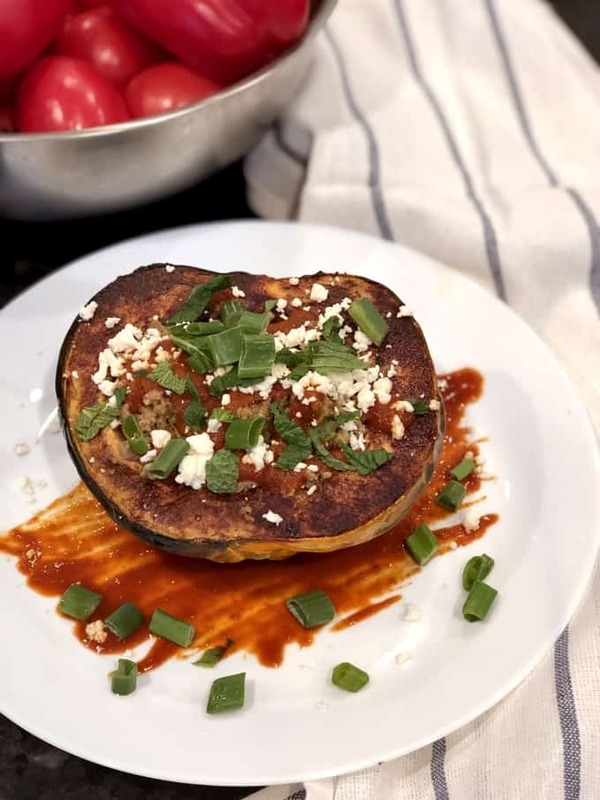 I halved and acorn squash, rubbed each side with pumpkin pie spice and a little olive oil and then roasted it. I put the Green Chili Turkey inside and then topped it with a red chili sauce, crumbled cheese and green onions. Keep it low carb and serve alongside sautéed summer squash, zoodles or over cauliflower rice. 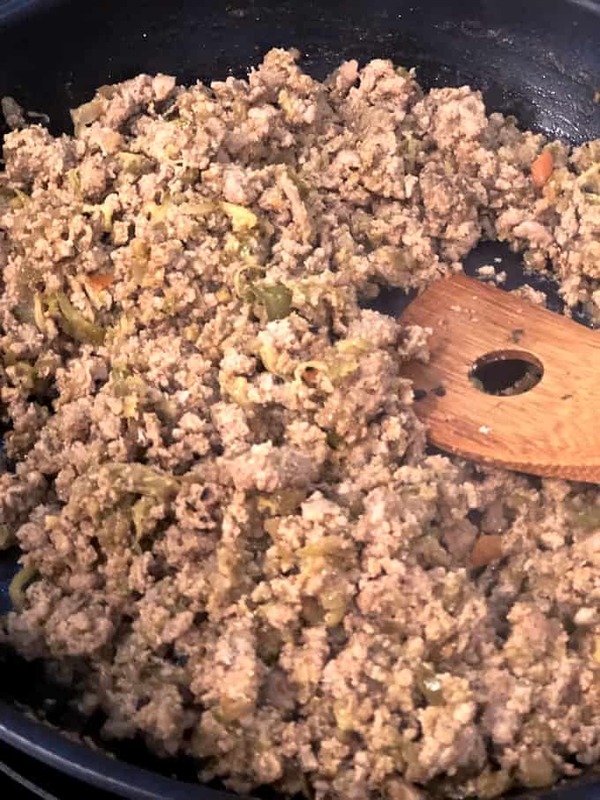 This Green Chili Ground Turkey makes a great taco salad. Use as a filling for tacos, burritos or quesadillas. Add it as a topping for a baked potato or sweet potato. Serve it in a bowl with brown rice or riced cauliflower, and beans. Serve with mashed potatoes and veggie of choice. Stir in some cooked macaroni to create a tasty Skillet Green Turkey Chili Mac (aka Southwestern Goulash). Spread a thin layer of beans on the tortilla. Top beans with leftover green chili turkey and shredded cheese. Bake at 375F degrees until crispy. 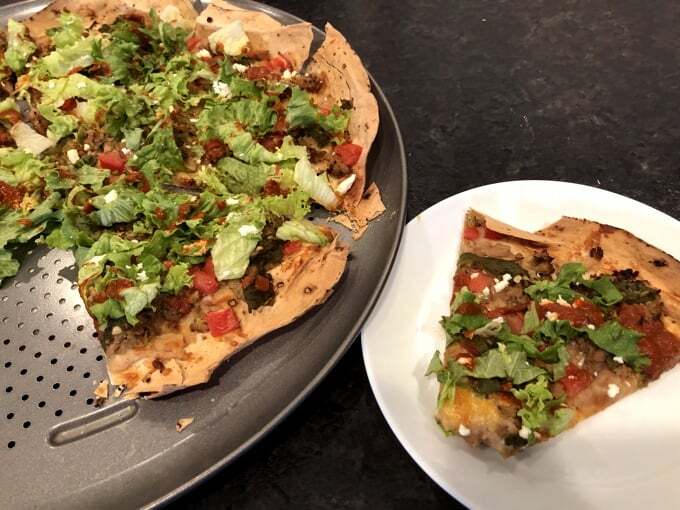 Remove pizza from oven and top like a taco with lettuce, tomato, green onions, and salsa. # 2: Taco Casserole. Mix leftovers with black beans, top with cheese and bake. Serve with chips and salsa. 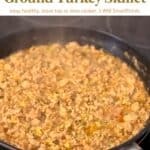 #3: Green Chili Ground Turkey Soup. Heat leftovers in a pot along with chicken broth, diced green chilis, and corn. Top with diced avocado, tomato and cilantro. 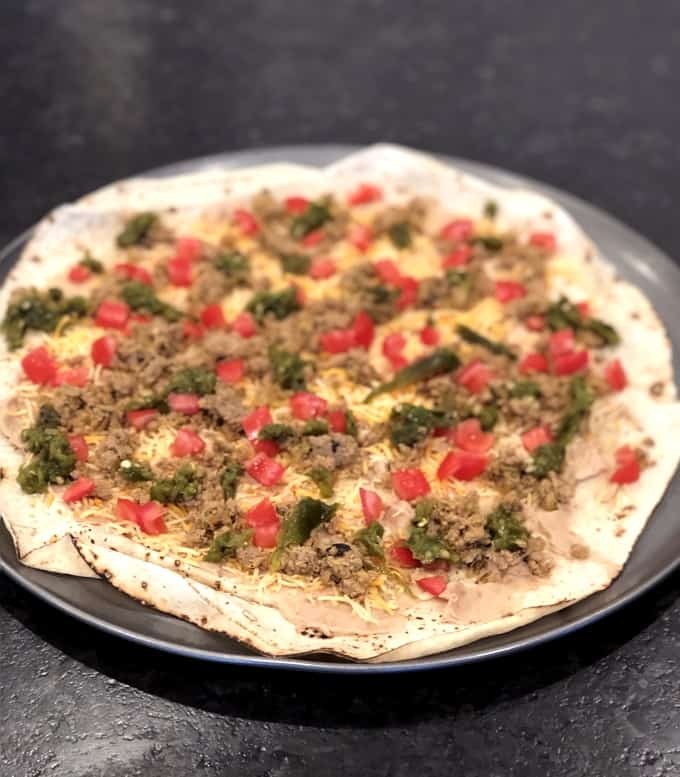 #4: Green Chili Ground Turkey Cheese Dip: Add leftovers to a small slow cooker with a can of corn, Rotel (diced tomatoes and green chilies) and light cream cheese, cover and cook on low for 3 to 4 hours or until warm for a tasty dip. #5: Serve it with eggs in the morning for a hearty satisfying breakfast. #6 Make a low calorie breakfast burrito. Mix warmed leftovers with scrambled eggs and wrap in a tortilla. #7: Southwestern Shepard’s Pie. Mix leftovers with a cup or two of mixed veggies and spread into a baking dish. Top with mashed potatoes and bake until heated through. Get creative with your leftovers. If my combinations don’t sound good to you, try something else. 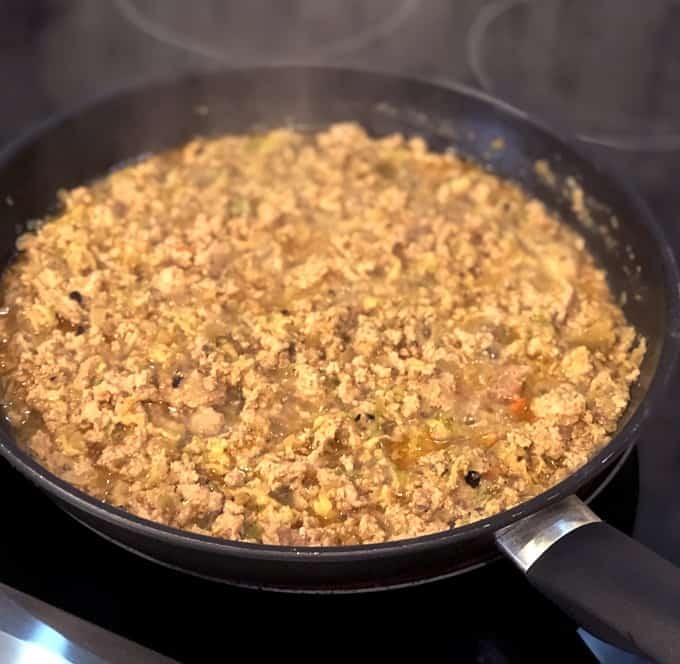 If you’ve made this Green Chili Ground Turkey, please give the recipe a star rating below and leave a comment letting me know how you liked it. And stay in touch on Pinterest, Facebook, Instagram and Twitter for the latest updates. The flavors of the salsa verde pairs well with ground turkey. Little to no additional seasoning required. Make it as mild or spicy as you like by using your salsa verde of choice. Gather ingredients and shred 1 cup zucchini - using paper towels, squeeze any excess water from the zucchini. Cook on medium/high heat for 15-20 minutes, or until meat is cooked. Cover and cook on LOW for 4 to 6 hours, or until done. Add additional diced green chilies, jalapeños or even Serrano peppers if you want to kick up the heat. If the turkey, zucchini and salsa releases quite a bit of water while cooking, don't be alarmed. Just drain some or cook it a bit longer until it evaporates.